Chinese home-automation giant Tuya hits CES 2019, announcing Monster as just one of its 3,000 smart-home partners. Yes, Tuya is perhaps the biggest home-automation company Americans have never heard of. The Chinese giant has IoT-enabled some 30,000 devices from over 3,000 manufacturers. Over 100 million Tuya-powered products are deployed worldwide. Tuya is not a standard like Z-Wave. It's not a chip-maker like Silicon Labs. It's not a smart-home app like SmartThings. It's not a connectivity engine like IFTTT. It's some and all of the above. While most Tuya-enabled products are Wi-Fi today, the company also supports ZigBee, Bluetooth and GPRS wireless protocols, with Z-Wave (we hear) coming soon. Manufacturers can bring any of their own bits and pieces, but Tuya could instead do all the heavy lifting for one tiny per-device licensing fee. The result of this Tuya turnkey solution is a low, low price of entry for smart-home product developers, and amazingly cheap prices for consumers. For that flat fee, the manufacturer gets turnkey connectivity and cloud-based resources that include such advanced features as facial recognition (just announced at CES), not to mention Tuya's own, fairly decent smart-home app called Smart Life. Out of 22,000 ratings on iTunes, the Smart Life app rates a 4.6/5. It gets a respectable 3.9 for Android. A company selling every imaginable Wi-Fi home-automation device under the Energizer Connect brand is at CES 2019. They use Tuya. Their motion sensors are $19. A pan/tilt indoor camera is $63. A door/window sensor is $20. Blink cameras are IoT-enabled by Tuya—or at least they were before Blink was acquired by Amazon. Monster (formerly Monster Cable) is launching a new home-automation line around Tuya, which was announced at CES. You may never see the Tuya brand, but it is dominating our home-automation lives. 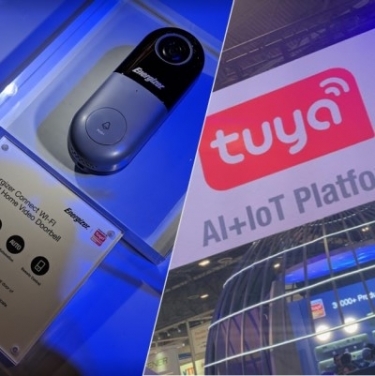 Click here to see a few Tuya-powered products spotted at CES 2019! UK-based Simon Scotland, founder of Extra Vegetables (acquired by control4) and a home-automation techy prepared this piece for CE Pro about Tuya and the other big home-automation company you've never heard of—ITEAD. Will the Chinese Take over Home Automation Standards? Both ITEAD and Tuya are making big inroads into the budget end of the domestic market. Do they have any ramifications for professional products and installers? It’s that CES time of year and the technical press is catching up with various gadgets from China. In the past year two companies, ITEAD and Tuya, have been making quiet inroads into the Smart Home/IoT market. Tuya is exhibiting at CES this year. What differentiates these companies is that they are not promoting a new wireless or connectivity standard. The devices, for the most part, use WiFi (although RF and Zigbee are also used). In essence, they provide an app framework and the basic hardware blocks for others to use. The other big deal with this offering is upwards integration. Access to Amazon Alexa, Google Assistant, Siri, IFTTT as well as Chinese voice services such as DingDong comes as standard. Back when IoT was young, products were rushed to market each sporting their own proprietary app. This often meant the product or app never lived up to expectations. Many were never launched. Consumers also decided that there were only so many apps they would allow on their phone. But after all a light is a light. Even a color changing one can only do so many things, right? This in many ways is the premise of most professional control systems. They provide the platform and integrate with many manufacturers. In reality, Pro-control systems are relatively small companies in a small market. They did not have the resources to keep up with the flood of IoT products. Companies then introduce their own lighting and other hardware, at which point their enthusiasm for integrating with others reduces. Both Tuya and ITEAD are working on a similar premise to the Pro-control world. They produce and maintain the apps. They will also provide templates for each type of device and the software. But they also provide hardware pieces to enable the communication. As Tuya put it, "One-Module, One-App, One-Link – Three services to get your products connected in 1 day." This is a huge head start for new entrants. Tuya’s approach is to provide the basic WiFi modules. They do not produce any self-branded hardware. Manufacturers promote that they use the Tuya or Smart Life apps (one and the same). Support is included for the usual suspects - Lighting, Switches, Fans as well as Ovens and Milk Makers! One interesting aspect of Tuya is that food recipes (yep food) and IR codes can be shared between manufacturers. The Tuya IR controller template provides a large database of codes including most split HVAC units. Tuya claim over 30,000 products are now supported on their platform. ITEAD are also a manufacturer in their own right under the Sonoff brand. Compatible devices from manufacturers promote that they use the e-WeLink app. Currently, over 80 brands are using the platform. Both apps provide more than remote switching and voice control. There is support for basic scheduling, looping timers, and scenes. You couldn’t call them control systems, but it is possible to link events from one device to another. Some basic and/or logic is also provided. Home geeks can combine these with IFTTT to provide further automation. There can be no doubt about the low cost of entry into these platforms. Retail prices for a US replacement single gang light switch is around $15, a basic inline switching module $7.50, and a ceiling fan driver to make it app compatible is $15. Eachen, who make devices compatible with both platforms, produce a voice-activated universal IR remote for your TV and HVAC for $15. They also provide a kit to convert your garage door with feedback for $35. Neo, currently best known for their Z-Wave devices, have launched a Tuya compatible range including a useful WiFi PIR for around $10. The big opportunity is for product designers with a great idea. Rather than having to develop and support connectivity hardware and an app, designers can use Tuya or ITEAD. This will drastically reduce product development cycles. Seriously, Should I Be Worried About This? The pro-market could both worry and dismiss these platforms in equal measure. There are always concerns about any cloud-based control system. Both platforms use AWS and show low latency rates. However, in the current climate, some may worry more about the Chinese being able to turn all the lights off in the world. Understandably, many pros prefer the reassurance of a local in-home controller. But the public is becoming confident and reliant on cloud-based voice services. Going forward, only higher-end customers will pay for increased security and resilience. It’s also possible to dismiss these on the basis of the quality of the products themselves. The visual aesthetics may be too ‘Chinese’ for some. There's nothing in the technology that dictates the visual design. So better looking products could arrive. Having experimented with products compatible with both platforms personally, they have proved reliable in my experience. None of the hardware has failed. I found a single back-end bug in the last year. Incidentally, after I reported it via a forum it was fixed within 24 hours. Is There an Opportunity Here? This depends on where you position your installation business. Don't dismiss these products as a value-add sale in simpler projects. Others will prefer to wait and see if products with the potential for margin appear. The big opportunity is for product designers with a great idea. Rather than having to develop and support connectivity hardware and an app, designers can use Tuya or ITEAD. This will drastically reduce product development cycles. Watch this space……. Scope out some more photos by clicking here! Simon Scotland has spent over 18 years in the Home Control industry. He initially ran a London, UK based installation company. He then co-founded Extra Vegetables, the world’s first driver store. This was later acquired by Control4. Rumours of his retirement are substantially true. However, he still spends time experimenting and is advising on the use of home technology for dementia sufferers.